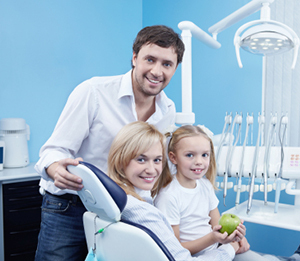 In general, the main focus of family dentistry is to improve the health of your gums and teeth. It is very important to see a dentist every six months to have your teeth cleaned and examined. Dr. George Rizkalla is a general and cosmetic dentist who performs root canals, fills cavities,places same-day crowns, performs periodontal procedures to preserve bone and improve gum tissue, and can replace missing teeth. These procedures maintain your overall dental health and hygiene. General dentistry procedures are necessary for keeping your teeth and mouth healthy. It is also important to get your little ones in to see a dentist as early as 3 years old. We make sure that your child’s first visit to the dentist is a positive one! We give them special treatment, let them wear cool sunglasses, watch their favorite cartoon while in the dental chair, and let them pick their favorite toy when they finish. They will be proud of themselves and eager to maintain their precious smile. At Comfort Dental we can provide you with guidance, deliver preventive oral health services, and diagnose and treat dental disease in its earliest stages. Our dental care will help you maintain optimal oral health throughout your lifetime. If you want healthy teeth for yourself and your family, a picturesque smile, and improved confidence from looking and feeling your best, come see Dr. Rizkalla and his team at Comfort Dental.